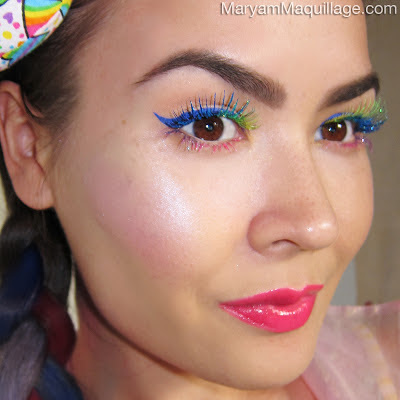 Maryam Maquillage: Celebrate Pride in Happy Rainbows! 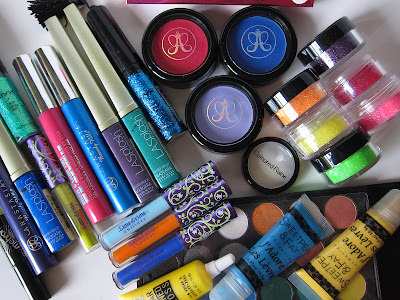 Rainbow Makeup -- the Happiest Makeup of All!! Lime Crime Uniliners Liquid Liners -- these rainbow liners are intense, precise, bright, and popping! Everyone should have these, so if you don't, stop snoozing and click on the link immediately! Anastasia Beverly Hills Hypercolor Brow & Lash Tint -- want blue brows and lashes? How about pink? Look no further -- you've found them! Anastasia Beverly Hills Hypercolor Hair Powder -- add a dash of flash to your hair without the dye, bleach or damage! Wipe-on, wash-out -- it's as simple as that! 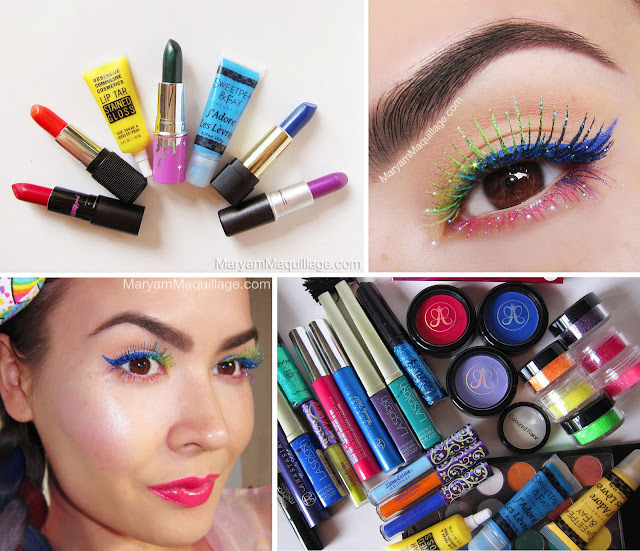 LASplash Cosmetics Waterproof Mascara -- don't let the heat & sweat ruin your colorful maquillage. These mascaras are waterproof, foolproof & bulletproof -- even though they hail from LA, they are a NYer's favorite! 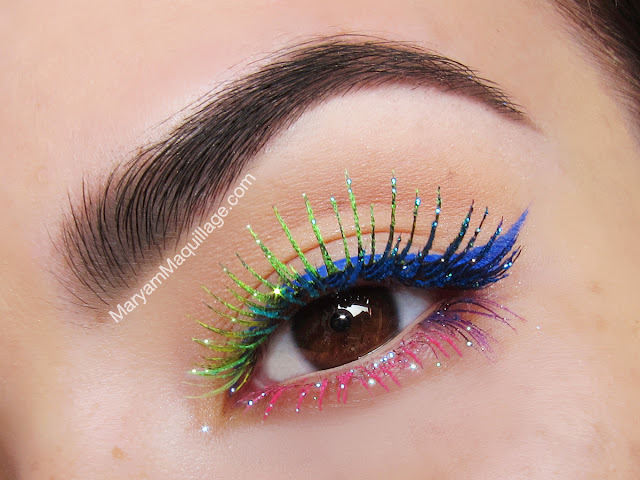 Coloured Raine Glitter Star Gazers -- a rainbow celebration is simply impossible without glitter! These cosmetic-grade glitters by Coloured Raine come in a wide array of colors and can be used on the eyes, nails, lips or face! 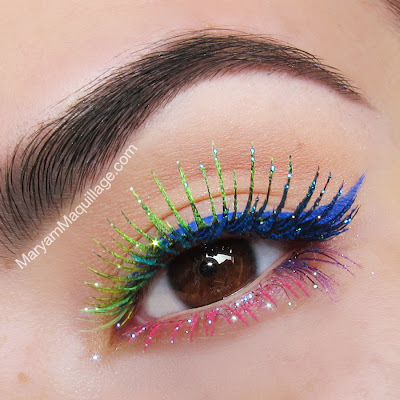 NYX Cosmetics glitter liners -- accentuate your cat eye with a glitter wing or add glitter lash extentions to your lower lash line for the ultimate in rainbow glam! 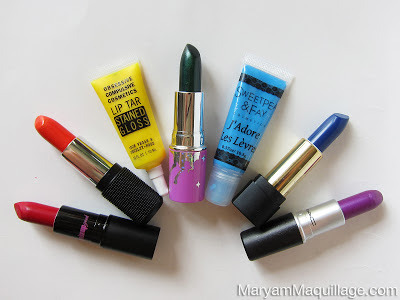 SweetPea & Fay J'Adore Les Levres artisan crafted liquid lipsticks -- these vibrant lip cremes come in a wide selection of colors, including sorbets, neons, and neutrals; and can be easily mixed to create any fun gradient! Coastal Scents Palettes -- by offering virtually every possible color in the spectrum, you simply can't go wrong with a CS palette. 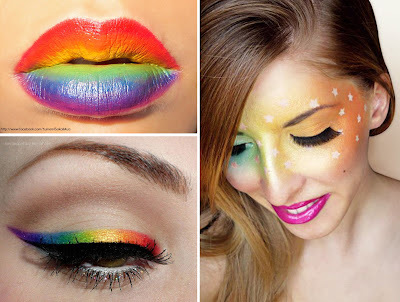 Get a matte 88-color palette and be set for the parade, or get them all and be set for life! Yumemi Sakai MUA: Rainbow Lips (top left) -- the perfect plump gradient done with Make Up For Ever Flash Palette & sealed with Sugarpill eyeshadows! Juicy!! Bows & Courtseys: Radiant Rainbow Liner (bottom left) -- the most popular rainbow look on the internet, and for a good reason -- check out Ronnie's tutorial here! Pigments & Palettes: Rainbow Gradient Star Mask (right) -- Meredith's ethereal take on rainbow makeup makes me smile from ear to ear, it's just perfect! If wearing false lashes like I'm doing, prepare the lashes in the same way as in the previous step, and set aside to dry thoroughly. Choose a pair that has long, dense, spiky hair fibers. For the top lashes and falsies, coat the hairs with a thin layer or glitter adhesive and use a tiny brush to attach the glitter. Keep a tissue under the lower lashes to catch the fallout glitter. Line the top lash line with a colorful liner and wing it out. I'm using Lime Crime uniliner in Lazuli. Once the false lashes have dried, apply carefully with dull tweezers. I kept the rest of my face somewhat simple with glowing iridescent blush, stained pink glossy lips and natural color brows. These are the most gorgeous blushes to have ever landed on planet earth and they are absolute must-haves -- not just for the parade, but for every joyous occasion of your life! ...and I'm not done yet! Dress up your rainbow makeup with this ÜBER CUTE Rainbow headband bow from Juicy Bows -- the most perfect accessory for the celebration of PRIDE!!! This bow is super comfy, soft, and hand-made with love. This baby can be purchased through Juicy Bows' Etsy Store: check out the rest of the line's adorable bows, turbans, and other hair accessories. 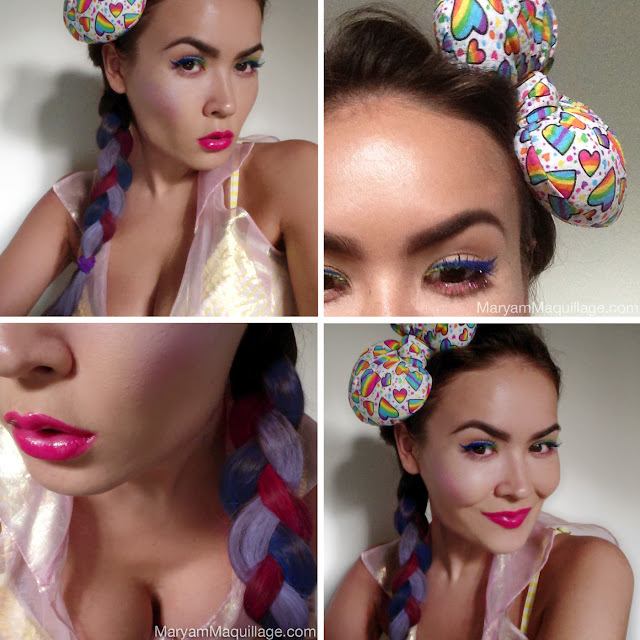 For my Colorful Braid, I used Anastasia Beverly Hills latest Hypercolor Hair Powders in Royal, Redlicious and Lola-Lilac. Wow so colourful, I love it!